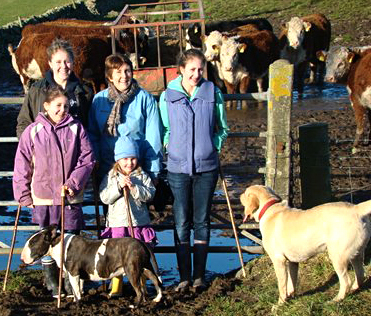 I live and farm with my wife Alexandra and our four daughters (Rosie, Ellen, Olivia, Kristina) at Mains of Airies in southwest Scotland. 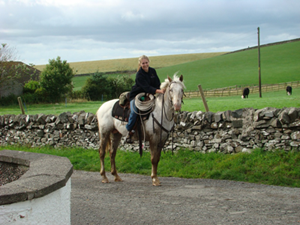 My leisure interests are shooting, fishing, horses and visiting other folk's Herefords. I run the farm under the Specially Selected Scotch Farm Assurance Scheme. During the early 90's we moved to a policy of breeding our own female replacements and expanded the pedigree cows to 180, which replaced the commercial crossbred beef suckler cows. Our main reason for this was our fear of buying-in BSE and also the increasing influence of the Holstein on the constitution of the cattle. By the mid 90's we had introduced Angus bulls to a portion of the herd with the aim to try out the Black Baldie as an alternative suckler replacement female. 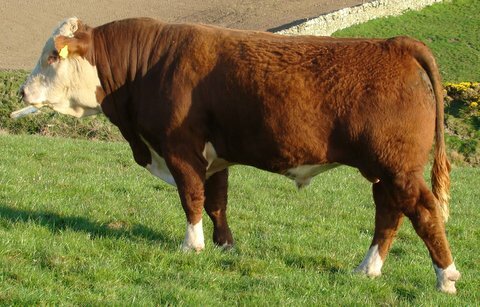 In 2006 & 2008 we introduced American Line One genetics and now maintain a small nucleus of straight Line One females within the Ervie Hereford herd. Today, the Ervie Hereford herd of 170 pedigree cows and their followers graze the exposed coastland of the Rhins of Galloway. The majority of the bull calves are kept for sale as breeding bulls. 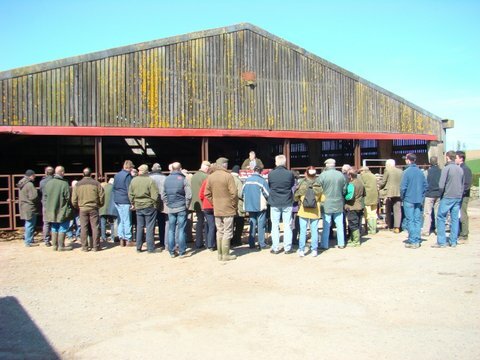 As commercial demand for our bulls strengthened, in 2010 we held our first Spring Bull Sale and continue to hold this on the first Saturday in May each year. A small proportion of the cows and all yearling heifers are mated to an Angus bull with a good demand locally for the Black Baldie female. Alongside the Hereford herd we run the 35 strong "Airies" flock of pedigree Texels as well as our 200 strong “South Airies” Romney flock. 120 Blackface stock ewe lambs are wintered annually for my cousin John Scott, Garchew, Bargrennan. Farm policy is for low input costs whilst maintaining a high quality end product. Farm labour has reduced to 2 part-time workers, with cropping contractors used as required. The 600 acre farm is predominately grass with a rotation of kale followed for 2 years with spring barley/oats, then back to grass. Blends of the most productive new clover varieties are incorporated into our grass mixtures producing high output from our grazing swards with reduced nitrogen fertiliser applications. By strip-grazing kale over winter with heifers and dry cows we have reduced our silage acreage and costs. Low-cost management suits the Hereford herd and economic principles also drive our breeding selection with regard to good fertility, longevity and problem free cows. Much emphasis is placed on breeding cattle with good feet and legs. Cows to have tight level udders with smallish teats. Bulls well balanced with clean underline and sheath and good even sized testicles. 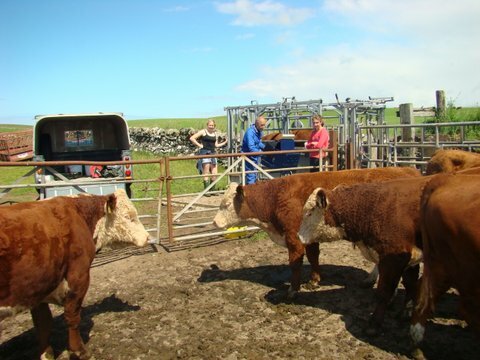 The herd is performance recorded and yearling bulls and heifers are scanned for muscle and back fat in a bid to select replacements that will improve red meat yield. We operate a line breeding programme, using sires resulting from our imported Line One importations and have established five female “tribes” within the Ervie herd to prevent our bloodlines from becoming unacceptably close. By maintaining a strong performance line-breeding program, selecting for important commercial traits, coupled with strict culling, our aim is to establish a recognisable Hereford “improver type” that will perform consistently and match the requirements of top commercial beef producers. Our eldest daughter Rosie is currently studying for a Range Sciences degree at South Dakota State University in the USA. 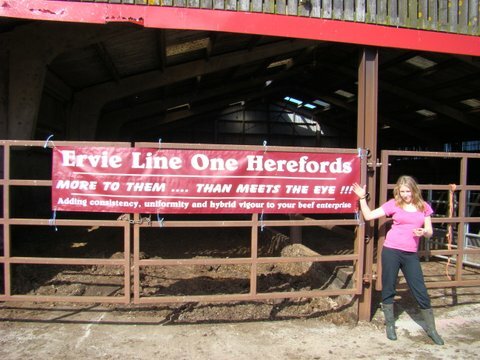 Jill Hotchkiss, editor of the “Hereford America” cattle newspaper, asked Rosie to write an article on her family’s Hereford involvement. The September 2015 issue features Rosie’s first stab at journalism! Rosie's article appears on the front cover of Hereford America and continues thru pages 4,6,8,10 and 14. The whole publication (which will be downloaded upon clicking the link below) consists of 52 pages and is 44.8 MB in size. This may take several minutes depending on the speed of your internet connection.